I was pleased to speak at an event hosted by USDAW and Co-operative Party at Labour Party Conference. Focused on the abuse and harassment that shop workers face on a daily basis and the challenges the police face in responding, it was invaluable to hear from shop workers on their experiences and discuss how we can work together to tackle it. Last year in Merseyside more than 125,000 crimes were committed, including 13,664 violence with injury offences, and 3,237 sexual offences. These figures are staggering. They highlight that Merseyside has seen a 13.8% increase in overall crime in the last 12 months. Sadly, this reflects the national picture. After years of crime declining, it is once again on the rise. But while crime is increasing and getting increasingly complex, police budgets are shrinking. In Merseyside we are acutely aware of this. We have lost over a third of our grant from the government and have been ranked as the 3rd worst hit police service in the country; since 2010 we have lost over 1500 officers and staff. The Government’s response has been derisory. Ministers claim to have invested millions in policing when, in reality, all they have done is shift the burden on to the poorest households like those we have in Merseyside. This is no way to sustainably fund our police. However, despite all of this there is still good work being done, both here in Merseyside and across the country, to tackle retail crime and the impact it has on shop workers. Shop workers provide a vital service to our communities. Not only that, but they play a vital role in tackling crimes and promoting community safety, from refusing to sell alcohol to underage customers, to restricting the sale of fireworks, and identifying vulnerable people who may have been affected by fraud. Now, with the introduction of new legislation restricting the sale of knives, shop workers will be at the frontline of implementing this change too. So, it is only right we recognise that and provide proper support and protection from abuse while they are doing their job. Merseyside Police has developed excellent working relationships with businesses to look at how they can work together to better protect their staff. For example, in Liverpool, the Business Improvement District, are funding two PCSOs that are solely dedicated to working with businesses in the city centre. This has meant a faster, targeted response when it’s needed. Some local shop owners are targeted because of their ethnicity and so police are working with the community to challenge that behaviour. This includes the distribution of tiny video badges which have provided a great tool in preventing hate crime and anti-social behaviour, and bringing those who perpetrate it to justice. A bill was recently passed calling for extra charges to be levied against individuals who abuse emergency workers, while they are doing their job; I see no reason why shop workers shouldn’t be afforded the same protections. 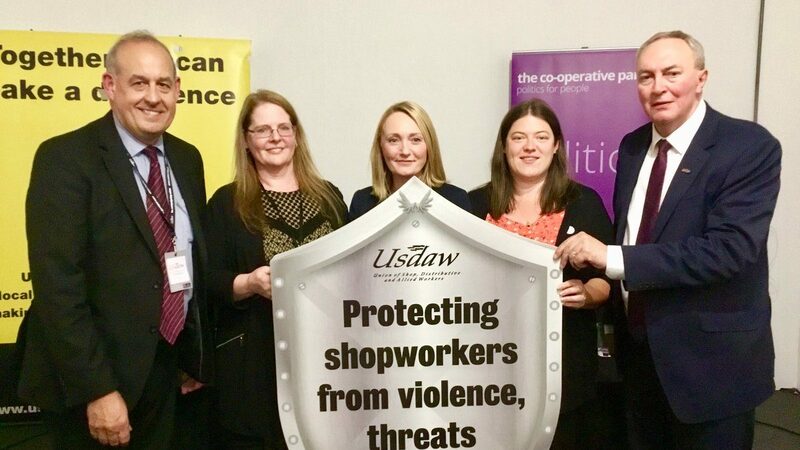 Both the Police Commissioner, Jane Kennedy and I welcome the Freedom from Fear campaign USDAW have launched, calling for increased penalties to be applied to individuals who abuse shop workers.